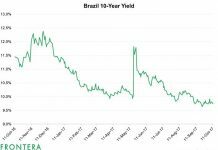 As growth in developed markets continues to level off, US-based fast food chains are seeking growth in emerging markets (EEM) more aggressively. 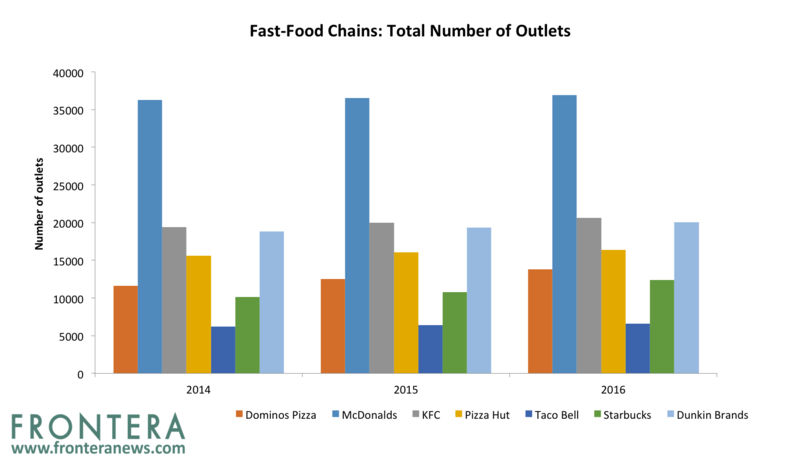 Global food chains, QSR operators and branded food manufacturers are pivoting more resources to emerging markets as growth slows down in Europe and North America. Emerging markets present an attractive opportunity for these companies as they are home to nearly 80% of the world’s population but account for merely 60% of global food consumption. By 2050, the population of emerging markets will rise by 40% to nearly 3 billion. 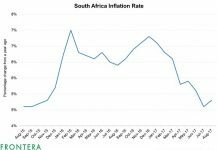 These countries are also witnessing a rapidly growing affluent middle class population with growing disposable income as gross domestic product in these markets is expected to rise by nearly 5.7%. 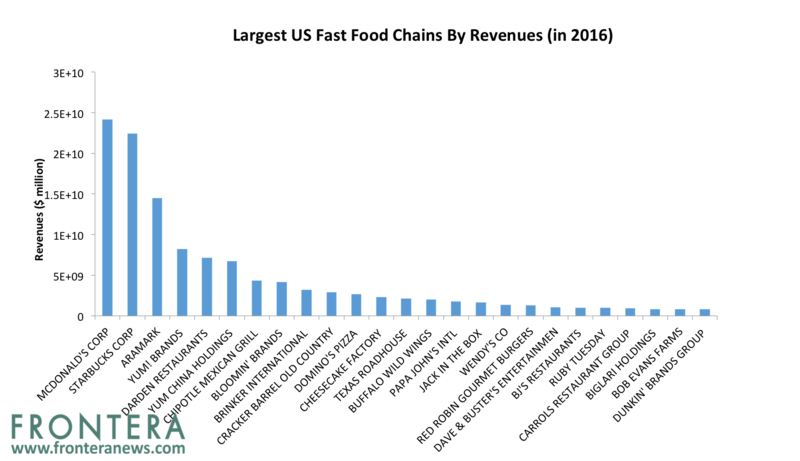 A study by Transparency Market Research forecasts the fast food market to grow to $600 billion by 2019, at a CAGR of 4.4%. In the past one year, the S&P Food & Beverage Select Industry Index has gained 16%. 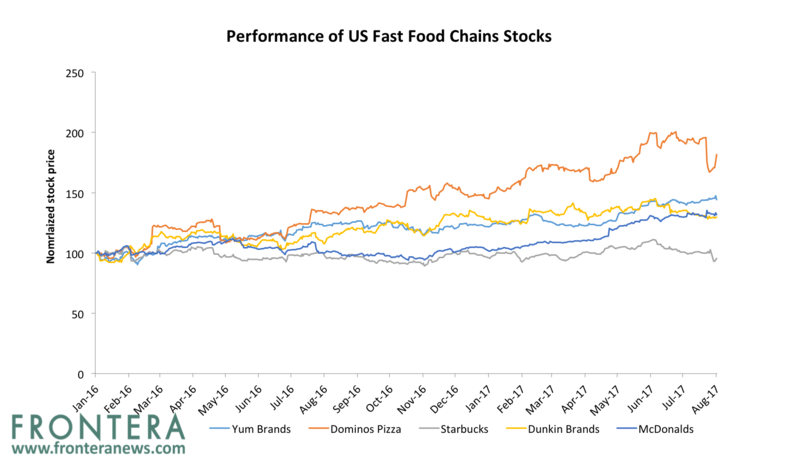 Investors seeking exposure to US Fast food chains could consider the Vanguard Consumer Discretionary ETF (VCR), Powershares Dynamic Leisure and Entertainment ETF (PEJ) or the Powershares Dynamic Food & Beverage ETF (PBJ). YTD, shares of these ETFs have gained 19.4%, 14.9% and 3% respectively. Yum Brands (YUM) (YUMC), the parent company of large fast-food chains like Pizza Hut, KFC and Taco Bell generates nearly 50% of its revenues from developing countries. “We believe we have a long runway for growth in emerging markets like China, India, Africa, Russia, Indonesia, Vietnam and many others,” a Yum spokeswoman said in email. In the top 10 emerging markets, Yum Brands has just two stores per million people —compared with 58 stores per million in the U.S. About 95% of the chain’s 6,700 locations are in the U.S.
Yum Brands owned Taco Bell recently announced plans to operate 9,000 global restaurants over the next 5 years, which equates to opening an average of 500 restaurants each year, much higher than its previous record of 200 restaurant per year. The franchisee plans to expand aggressively in Canada, China, Brazil and India along with entry into new countries. Taco Bell also partnered with Sri Lanka franchisee Gamma Pizzakraft Lanka (Pvt) Ltd to open its first restaurant in Sri Lanka. The company entered India several years ago and had no less than 13 restaurants by 2016. Pizza Hut, also owned by Yum Brands, has inked a deal with Ethiopia’s Belayab Foods and Franchise PLC to open 10 Pizza Hut restaurants as part of its expansion plans in Africa. “We will start off with three outlets first in six months time and open 10 stores within the next three years,” Michael Ghebru, a shareholder of the project, told Reuters. Kentucky-based Yum already operates nearly 1,000 restaurants in Africa while Pizza Hut is in nearly 188 locations across Africa. “Let’s be prudent because in Africa there may be some levels of instability and also when you are opening some routes that take time,” Ewan Davenport, General Manager of Pizza Hut Africa, said. The company plans to open 50 stores annually in Africa. Credit Suisse analysts are bullish on Yum Brands on the back of Taco Bell’s international expansion strategy. Taco Bells represents nearly 30% of Yum Brands’ profits and makes up only 15% of Yum’s international portfolio. “[Taco Bell] made the most compelling and realistic case for international unit growth acceleration we’ve heard in 10 years of covering YUM,” Credit Suisse analysts Jason West and Jordy Winslow mentioned in an investors note. “Franchisee interest in unit development continues to grow, and there are multiple levers of comp growth in the pipeline.” The analysts also raised the target price on Yum Brands to $78 from $75 earlier. 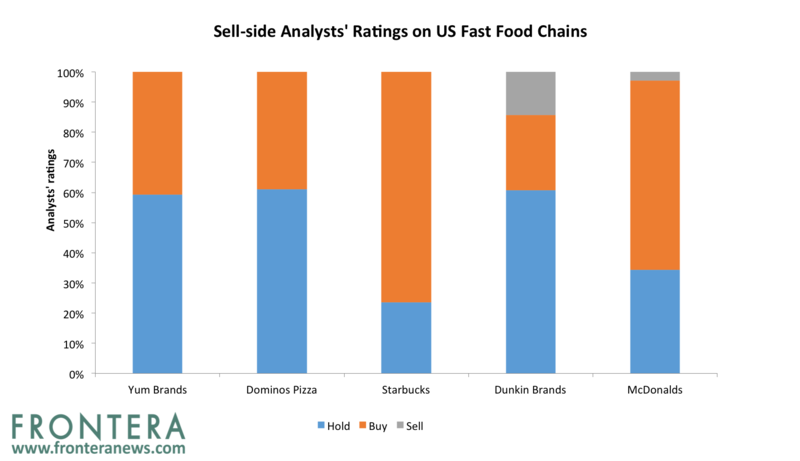 Currently, 11 sell-side analysts have assigned “buy” to Yum Brands, while 16 assigned hold ratings. Year to date, shares of Yum Brands have gained 22.6%. Yum Brands have a 12-month consensus price target of $77.7 indicating an upside potential of 4%. Emerging markets have provided double-digit returns for McDonalds as sales begin to decline in the US and Europe. McDonalds (MCD) has expanded aggressively in countries such as Malaysia, South Korea and China. 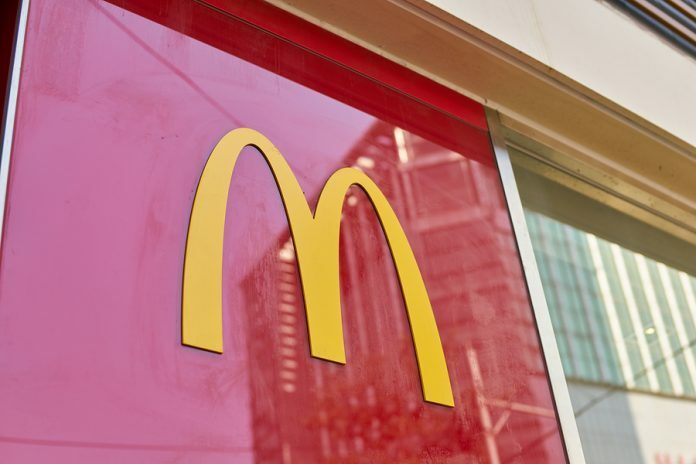 McDonald’s plans to open more than 1,500 restaurants in China and Korea with local partners over the next five years as it refocuses on expansion in the world’s second-biggest economy. Post expansion, the company would operate nearly 4,300 stores in these countries, 54% higher than its current 2,800. China and South Korea make up 7.8% of McDonald’s store count. McDonald’s plans to double its presence over the next 10 years in Malaysia. The company has committed investments of $325 million to open 188 outlets by 2025, which would increase its Malaysian store count to 450. McDonald’s generated $24.2 billion in revenues in 2016. Year to date, shares of McDonald’s have gained 30.4% making it the best performer among its peers. China (FXI) is Starbucks’ (SBUX) largest market outside of the United States (SPY) and the company expects it to overtake the US one day. 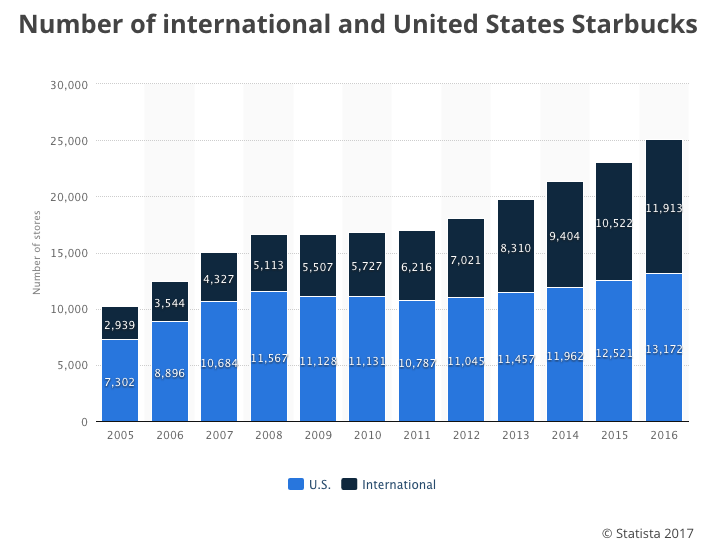 “Not only will China one day be bigger than the U.S., but our business in China will demonstrate that we will be one of the…most significant winners in terms of a Western consumer brand,” Chairman and ex-CEO of Starbucks Howard Schultz said at the company’s investors day in December last year. In October 2016, the company announced plans to open 12,000 stores globally in the next five years. Of these, half will be in China and the US. Starbucks plans double its number of stores in China by 2021. Within the next five years, the company plans increase the number of stores in China to 5,000 from the current 2,300. To achieve this goal, the company would add 10,000 new jobs in China and open 500 stores per year. Starbucks derives 13% of its revenues from the Asia Pacific region. The company is expanding its footprint in a nation of traditional tea-drinkers where the growing middle class is slowly adopting a coffee culture. Starbucks operated 7,183 restaurants in Asia Pacific and 2,870 in the EMEA region by fiscal Q317. Year to date, shares of Starbucks have gained 0.7% making it the worst performer amongst its peers. Dunkin Brands (DNKN) is betting big on growth in emerging markets to supplement stagnation in the United States. 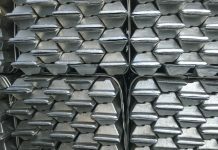 The company is in the process of expanding footprint in emerging markets of Asia and the Middle East. Dunkin Brands also sees growth potential in South Africa and opened its first store in 2016. In India, Dunkin Donuts’ Indian franchisee partner Jubilant FoodWorks aims to open 500 stores over the next 15 years. The expansion into India is part of the company’s broader strategy to grow in the Asia-Pacific region. It plans to open 350-450 outlets outside the U.S. this year, many of which will be in Asia. The company is also planning to enter Brazil. In the Asia Pacific region, Dunkin is focusing on India, China and Taiwan. “Emerging markets are attractive because they are growing very quickly, they’ve a fast-growing middle class, and they love American brands,” Dunkin Brands Chief Executive Nigel Travis mentioned. These markets will contribute a “disproportionate” part of the company’s future revenue, he added. In 2016, South Korea accounted for approximately 36% of total sales from international operations, while Japan represented 21% of international sales. Meanwhile, the Middle East accounted for 17% of Dunkin Brands’ international sales last year. In Q117, Dunkin Brands operated 12,287 Dunkin Donuts restaurants across the globe with 3,403 stores in international markets. The company plans to open 200 new restaurants in international markets over the next one year. Year to date, shares of Dunkin Brands have gained 2% and have underperformed peers as well as the S&P 500 Index. 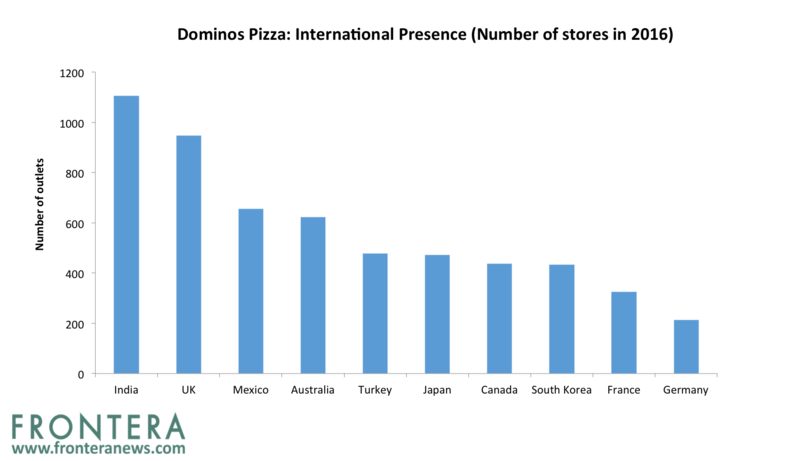 Dominos Pizza (DPZ) is thriving in emerging market countries including Brazil, India, Turkey, and China. India and the UK are the largest markets for Dominos outside of the US. Surprisingly, China isn’t even in the company’s top five. In 2016, Dominos clocked global sales of $10.8 billion, of which 50% came from international markets. In India, Dominos is the largest international food chain with 806 stores; nearly double that of McDonald’s. India is the largest revenue source for Dominos in international markets. Recently, Dominos opened its 14,000th worldwide outlet in Malaysia. This is the 200th store in Malaysia and 3,500th in Asia-Pacific for the company. In 2016, Dominos operated 8,440 international franchise restaurants. In the last 12 months, Dominos increased its store count in international markets by 1,110, and entered Sweden. 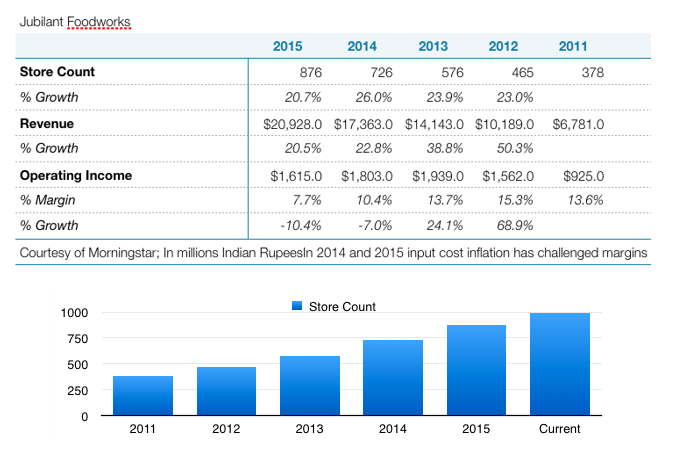 Over the next 3-5 years, the company expects to increase store count by 6.8% annually. Year to date, shares of Dominos have gained 21% and have outperformed the S&P 500 Index. 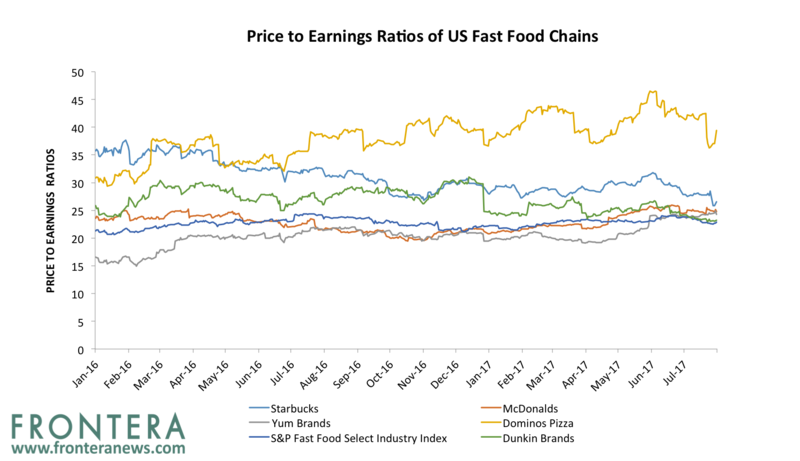 Sell side analysts remain bullish on fast food chains as they gain from high growth in emerging markets and rising consumer spending. Yum Brands has received 11 buy ratings, 16 hold ratings and no sell ratings, while Starbucks has 26 buy ratings and 8 hold ratings. McDonalds has received 22 buy ratings, 12 hold ratings and 1 sell rating. Dominos Pizza has received 7 buy ratings, and 11 hold ratings while Dunkin Brands has received 7 buy ratings, 17 hold ratings and 4 sell ratings. 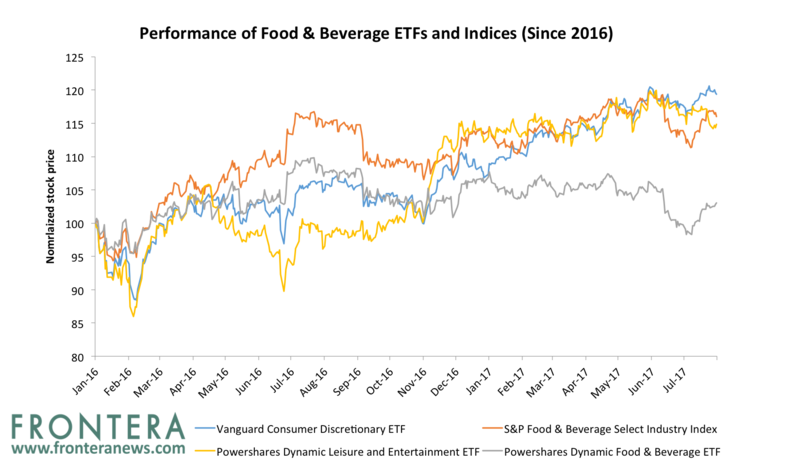 Valuations within the food and beverages sector are attractive with the S&P Food & Beverage Select Industry Index trading at an one-year forward PE ratio of 22.5x. Yum Brands and Dunkin Brands are the most attractive stocks based on their cheap valuations. These stocks have one year forward PEs of 23.1x and 24.2x, and are trading at the steepest discounts to their peers. Meanwhile, Dominos Pizza, McDonalds and Starbucks are trading at PEs of 24.9x, 26.3x and 39.2x respectively. Previous articleNew Gulf Order: How Long Will It Take Doha To Realize Time Is Running Out?